Bugged, "within a single phase, win 5 games"
it's these stupid events that they spend so much time and money on when they should spend it fixing the damn game in the first place. I just spent hours trying to get 5 wins on GA before the event time expired hoping to get at least 1 crate since I was out of town this weekend. I finally get my 5th win 20 minutes before time ran out....and the damn system didn't count it. Then time expired in middle of next match so that win didn't count either. Edited by Verm_, 27 August 2018 - 04:52 AM. Thank you for your reports, we definitely appreciate them. Your feedback confirms the mass character of the problem which should help solve the issue and discuss the compensation. At the moment the team is working on the investigating the nature of the problem and we are discussing the timing and level of compensation for inconvenience. -Enemy aircraft become invisible, you can see the name of the bot/player, but no aircraft to aim for. -After re spawn, my aircraft was not visible. All I can see is an ally bot flying around, which is what I was looking at when waiting to re spawn. Worse still, I know my aircraft is flying, I can hear it, I can hear my guns, but I can't control it. Thankfully my aircraft re appeared after the next re spawn. -My military base firing missiles at my own garrison. Probably not doing any harm to my garrison but certainly not helping me attack the enemy. -Bots dictating the outcome of battles far too often, unevenly matched bots. -Speaking of bots, what's with their new ramming tactic? Heavy fighter bots get a whiff of a head to head and before you can turn away they ram you! Reading here, there are more bugs that I haven't seen also. Sadly, only been playing for a few months and I'm already starting to be over it. 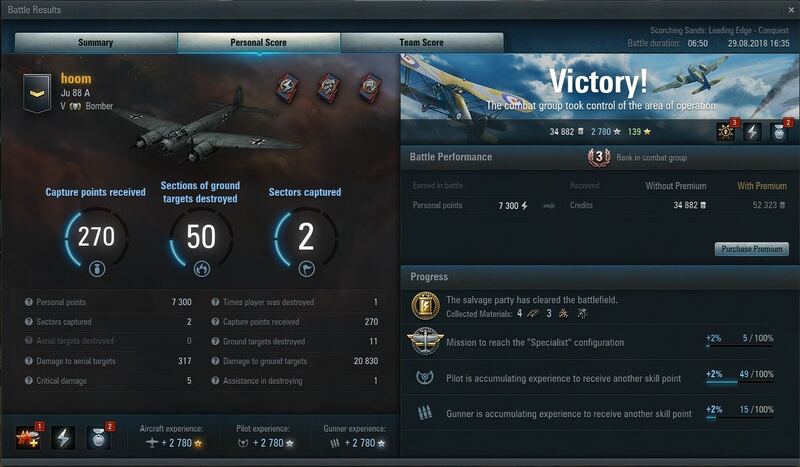 It was almost the last straw a couple of nights ago when a vastly experienced player in tier IV told me how bad I sucked (among other expletives) because I only managed 2000 points and capped 2 sectors when he scored 17000 points. I only play here for fun, not to be abused. This arcade game has next to nothing to do with real flying, and with over 17000 hours of actual stick time, I know. Yet some people here take it seriously and think they're aces. Anyway, I seem to have gotten a little OT, thanks for listening, my cranky old man rant is now over, Over. Edited by Vradin, 27 August 2018 - 11:21 PM. We are aware of this issue and are working to get it corrected as soon as possible! Thanks At least I know I'm not going crazy ....or the only one. Good point....I'll rephrase...."At least I know I'm not going more crazy...."
The hot-fix was applied during last server restart this night. Please, check the issue (no income after battles, no mission progression) and report if the problem remains. Any info on compensation for people who wasted a long time playing games, not getting crates, xp, tokens etc? Edited by arrrgh, 28 August 2018 - 10:51 AM. Thank you for the information, glad to hear that everything seems to work! The timing and level of compensation is still being discussed, so I have no any specific information at the moment. I hope that all pilots will get compensation. I, for one, just didn't fly after I saw that my wins didn't register. 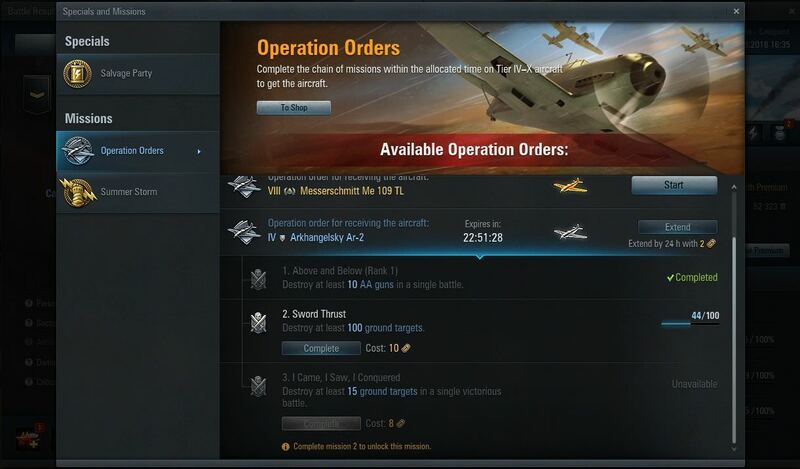 I'm getting an issue on 2nd mission Sword Thrust of Ar-2 Operation Order. The Mission screen is incrementing OK though. Edit: it did display the Completion when I hit the 100 ground target kills though. Edited by hoom, 29 August 2018 - 06:48 AM. Thank you for your report, the issue concerns particularly the 2nd mission of Ar-2 Operation Order and is known. Luckily, the problem is purely in displaying the progress. On the plus side, they handed out compensation, at least to me. On the minus side, it was less than the bare minimum compensation, really. I was playing for crates....but there were none in the compensation. - 1 day prem - I don't really care about prem time (I have lots), but 1 day compensation is really low balling it. The bug also existed for more than a day. The trivial amount of compensation misses the fact that I would have played all day (on the weekend), to get more crates. Only partially compensating for the games played, and ignoring the fact that we could not play more games, is not exactly generous. The real problem for you, would be the man power hassle of manually doing compensation. That part I get. But, why then shortchange the people you are compensating, when it would cost you nothing to make them happy? - But, why then shortchange the people you are compensating, when it would cost you nothing to make them happy? ^^^this, literally this. The only reason I have been playing at all is to get XP for my German GAA line. Of course, during invasion, unless you are flighted, that doesn't make sense. In any case, it would have been a nice gesture to help folks out. I got one whole fire extinguisher. I wasn't expecting much, because I stopped playing right away. But man, that's like leaving a penny tip. SonicPariah and blindfold might be listening to us, and sending our ideas along, but Persha sure isn't getting the message. Apologies if the compensation was not up to your standards. We will see what can be done if another issue happens in the future.